Craig Safety is committed to safeguarding the information Users entrust to Craig Safety and believes every User should know how Craig Safety utilizes the information collected from the Website. This Website is not directed at children less than 13 years of age. Craig Safety may collect personally identifiable information from Users in a variety of ways. Personally identifiable information may include (i) contact data (such as a User’s name, mailing and e-mail addresses); (ii) financial data (such as a User’s account or credit card number); and (iii) demographic data (such as a User’s zip code, age and income). If you communicate with Craig Safety by e-mail, post messages to any forums, or otherwise complete online forms, surveys or contest entries, any information provided in such communication may be collected by Craig Safety. Craig Safety may also collect information about how Users use our Website, for example, by tracking the number of unique views received by the pages of the Website, or the domains from which Users originate. We may use “cookies” to track how Users use our Website. A cookie is a piece of software that a Web server can store on the Users’ PC and use to identify the User should they visit the Website again. While not all of the information that we collect from Users is personally identifiable, it may be associated with personally identifiable information that Users provide us through our Website. We may use third party ad networks to serve ads on the Website. The cookies received with banner ads served by these networks are used to collect and build anonymous behavioral profiles by these companies to deliver targeted ads and tracking referrals, and Craig Safety generally does not have access to this information. Craig Safety will use the information that you submit to provide requested services, to provide requested information, or to subscribe you to information we provide, such as our newsletter. We may use personally identifiable information collected through our Website to contact Users regarding products and services offered by Craig Safety and its trusted affiliates, independent contractors and business partners, and otherwise to enhance Users’ experience with Craig Safety and such affiliates, independent contractors and business partners. We may also use information collected through our Website for research regarding the effectiveness of the Website and the marketing, advertising and sales efforts of Craig Safety, its trusted affiliates, independent contractors and business partners. Craig Safety may disclose information collected from Users to trusted affiliates, independent contractors and business partners who will use the information for the purposes outlined above. We may also disclose aggregate, anonymous data based on information collected from Users to investors and potential partners. Finally, we may transfer information collected from Users in connection with a sale of Craig Safety’s business. Information about Users that is maintained on our systems is protected using industry standard security measures. However due to the rapidly evolving nature of information technologies, we cannot guarantee that the information submitted to, maintained on, or transmitted from our systems will be completely secure. While we are committed to protecting your privacy, we cannot guarantee security of any information that you transmit to our website. Once we receive your information, we will use reasonable efforts to maintain security on our systems. Please email us if you would like your Information updated or removed from our systems. 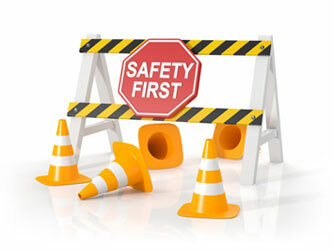 Craig Safety maintains this Web site in part to enhance public access to safety and compliance information. This is a service that is continually under development. We will make every effort to keep this site current and to correct errors brought to our attention. The documents on this site contain hypertext pointers to information created and maintained by other public and private organizations. Please be aware that we do not control or guarantee the accuracy, relevance, timeliness, or completeness of this outside information. Neither Craig Safety nor its contributors shall be held liable for any improper or incorrect use of the information described and/or contained herein and assumes no responsibility for anyone’s use of the information. In no event shall Craig Safety or its contributors be liable for any direct, indirect, incidental, special, exemplary, or consequential damages (including, but not limited to: procurement of substitute goods or services; loss of use, data, or profits; or business interruption) however caused and on any theory of liability, whether in contract, strict liability, tort (including negligence or otherwise), or any other theory arising in any way out of the use of this information, even if advised of the possibility of such damage. Links to external, or third party Web sites, are provided solely for visitors’ convenience. Links taken to other sites are done so at your own risk and Craig Safety accepts no liability for any linked sites or their content. When you access an external Web site, keep in mind that Craig Safety has no control over its content. Any link from Craig Safety to an external Web site does not imply or mean that Craig Safety endorses or accepts any responsibility for the content or the use of such Web site. Craig Safety does not give any representation regarding the quality, safety, suitability, or reliability of any external Web sites or any of the content or materials contained in them. It is important for users to take necessary precautions, especially to ensure appropriate safety from viruses, worms, Trojan horses and other potentially destructive items. How Safe Are Your Employees? Safety – Simplified and Online.